Ted Nelson speaks quite highly of the Digital PDP 11 series in his book Computer Lib / Dream Machines. 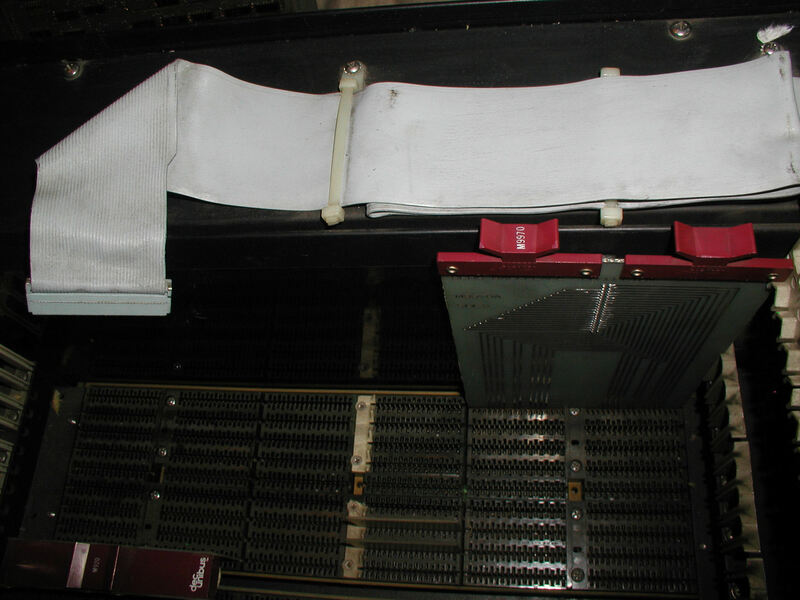 Picture of the PDP 11/05 NC card cage and M9970(in the wrong slot). Click image for hi res version. The only thing that prevented DEC from launching the PC revolution three years earlier was price, in my opinion. All of the other ingredients were there for a fine PC. The PDP 11/05 was the OEM version of the PDP 11/10, so you find all kinds of variations of this system sometimes paired with the DEC GT40 Graphic Display Terminal. 1) Cleaned (enough for now).. got all of the styrofoam peanuts, dust. 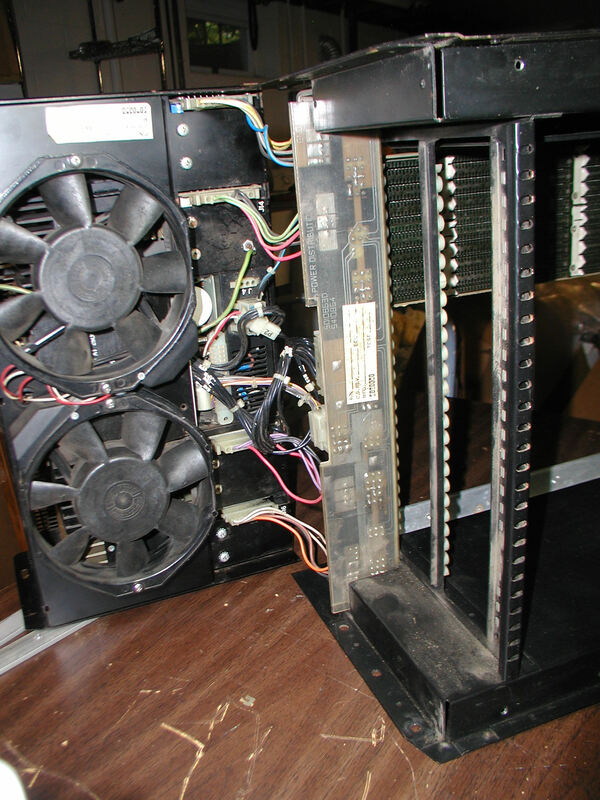 2) Started with an basically empty chassis other than a M9970 UNIBUS to connect expansion backplane to the main backplane and a few grant continuity cards, which must be present when no other card is in the row. Also present an M7856 serial card. 2.5) Added M9970 Berg backplane connector in the first slot up front. 3) Installed the logic boards M7260, M7261. 4) Added 8K core memory. H214 8K Core Memory with some sort of Companion card M930 in the remaining slots of the row, and between them a thin piece of metal shielding. 5) Next add G231 (memory driver) and G109C (control and data loops) into the first set of slots marked G231 and G110. So here is where we are so far.. The card card guide labels for a DEC PDP 11/05 NC Computer (which differs from the 11/05 S). Click image for view of all cards installed into unit. The system and interface cable are set for a 110baud/20mAmp teletype if you connect directly with the console, but The goal is to use the M7856 serial/clock card for faster RS232 communications using a serial terminal like a VT-52. I do not believe the VT-52 that I have has a current loop option. set the lowest address bit to 0-1-0-1 continuously. If you "run / halt" and observe the last light on the right (0); half of the time there should be a light. If it's always lit, or always not, there is a problem with the CPU at least. Check power supply. Moved the M9970 to the proper location in the bus, it needs to be in the middle slots. Matt and I were not able to send any data (or so it seems) through either the M9970 console interface or a M7856 I/O clock card. No evidence of data (no voltage) passing through the cable to indicate the attempt. Not 100% sure we have a working program either. We're not sure what ports to use with the M7856 while a M9970 is also installed, does a conflict exist? The 7856 can be set up many ways. If the console card's in place you need to pick a different address that doesn't conflict. Appendix b-4 has the vector addressing. Drop me mail or give me a call anytime. I'll try to find my PDP11 setup docs. The M930's not really a companion card. It had a bad DL11 card IIRC. I decided to run more system checks before doing more work with the M7856. I have the "PDP-11/05, 11/10 10 1/2 inch Mounting Box and Power System" Supplement 1. This has info on the interface cable and how to set up the PDP 11/05 with a serial terminal or teletype. Using a teletype as I/O is ideal for a proper restoration, eh? I have a teletype, so why not try to interface that with the 9970 console first? If that works, I will have more confidence that I can hook up the M7856. 2. Removed M7856 card for now, replaced with another Grant Cont. card. 3. Ran "Line Time Clock Interrupt Test" from 001000, returned the expected value of 000104. That means the clock is running. Turned off system, reloaded program and got same result - RAM held in core memory. 4. I have the cable that connects the M9970 to a teletype. I completed the wiring, but I did not get the reaction I was expecting. I have to make sure my teletype works properly. I am using my SWTPC 6800 to compare and contrast with the 11/05, and how they two interact with the teletype. I am starting to think that maybe I need to run the 11/05 bootstrap loader to get the same effect? Or does the teletype go into ready mode if it detects a 20ma current loop? The SWTPc and PDP 11/05 are not the same, the negative lines need to be separated. Here is a PDF of the cabling coming from the pdp 11/05, and the description of what wires are input and what wires are output. On the PDP 11/05 M9970 I can ID the TTY signals coming from the Berg connector. 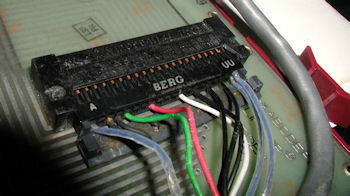 Photo of the wires coming from the Berg connector of the M9970 console card. Click for larger image. 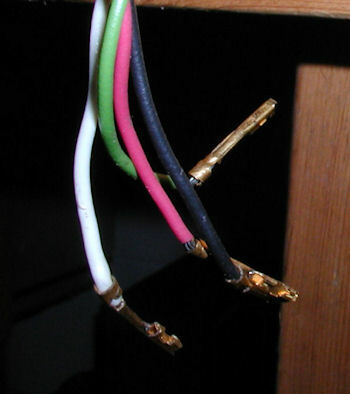 Photo of the wires coming from the mate and lock connector end of the M9770 I/O cable. Output (left): White = Receive+, Green = Transmit Data +. The black = - Transmit data and red = - receive data. Click for larger image. Note that on the other end, the white and green are reversed. 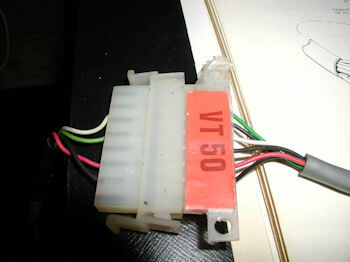 received data send (+): Term strip 4, #2 connector #6. You can bypass the connector by attaching the 4 wires directly to the terminal strip. The terminal strip is located behind/below the connectors. If you're making a cable with a special connector to match your particular computer card EITHER the terminal strip or #2 connector can be used. You can use both, just not at the same time. In the case of my PDP 11/05 the green wire coming from the computer connects to terminal strip 7 post. black to 6, red to 3, white to 4. When I load the program in core memory and run it, the system appears to be attempting to call the tape, but the ASR33 does not load the papertape of the system tape. It has the proper bootstrap leader value (ASCII 351)..so what gives? Finally got the computer to send and print "Hello World" to the teletype. Technically it sent TE]HJVYRTD, but once I get this thing in synch with the computer we're golden! There is a bits/parity adjustment needed on the teletype. Next - adjust teletype to match parity and bits or whatever is the problem, could be an adjustment needed on the pdp. More attempts to run a program on a pdp 11/05 that would cause "HELLO WORLD" to print on a teletype model 33 ASR. This time I have a second Teletype Model 33 ASR. it is wired for full duplex and 20mA. LOCAL mode works just fine, and I was quickly able to get to my previous stopping point when testing with the 1st TTY. I made numerous small adjustments and each time I re-ran the code that is supposed to print HELLO WORLD. No dice. I do get the correct number of characters each time (11), but I still have not been able to print HELLO WORLD. Try measuring the baud with an oscilloscope. Write a program that echoes what I type on the TTY through the computer and back to the printer. Also understand the code behind the program I found on the web that I think says HELLO WORLD, but I don't know for sure. It could have been written for a slightly different output device. I am also not sure if the TTY needs a stop bits/parity adjustment. Now have a 2nd teletype to use, I can dedicate it to the PDP 11 for now so as not to impact other systems' use of the 1st teletype.. Very informative. very nice. First time I saw this setup "up close"! The following UART sample program from the PDP 11/05 user manual is supposed to print whatever character you type on the TT keyboard onto the teletype's printer as if you were in LOCAL mode. I got help to convert this program to octal from RSX11M+ of the vintage-computer.com forum. THANKS! Problem is, it does not work. When I run the program the teletype buzzes but no chars are echoed to the printer. When I switch off the teletype with the program still running and then turn on again, the printer sends a string of FFFFFFFFF... chars to the teletype. Turns out the belt clamp that drives the printer was loose, the HELLO WORLD program was fine. Here is another test program that I pulled from one of the links in this thread, that types out all of the ASCII chars. PAL 11S see: sections 1.9.2and IIA 2.9.2 .. Chap 6. I have the wiring from the computer to the terminal strip correct, which is enough to receive from the computer, but not send. Next I need to connect a reader control circuit, and change some of the terminal connections and control unit wiring per DEC specs in the document linked above. I will have to settle for receive only mode until I can get the rest of the wiring and install a "reader run" circuit. DEC sold a reader run circuit board, part number 4915. I might have one of these lying around..stay tuned. Testing the M7260's up on a riser card, I verified with an oscilloscope that the baud rate of 110 was correct on both cards. HELLO WORLD! was working but not the echo chars program. It stuck me that there must be some interference on the teletype. If not there would be a problem with return only apart from a baud rate issue. For convenience I had a cable attached to UCC-6 connector 2 that was wired with a common I/O transmit for SWTPc communications. I also have wires coming from the terminal strip for other systems to use. It hit me while on a drive last night that the common I/O of the connector cable might be interfering with the PDP 11/05's ability to receive chars from the teletype. After removing the SWTPc interface cable the problem with the echo chars program was resolved. NEXT - Start testing simple papertape operations such as copying a short tape into memory or copying an entire tape. Since June of 2009 I have been working on this system. It's been a challenge putting all of the pieces together to implement a working "stock" PDP 11/05 with one 8K core memory (037744) and an unmodified teletype for I/O. I decided that I'd attempt to load BASIC despite the lack of a 4915 Reader Run card. I was told it might not be necessary and I decided I had nothing to lose. 1. Toggle in the bootstrap loader (listed above) for 8K low-speed reader. 2. I found a papertape with "Absolute Bootstrap V6" written on on it. I did not know if it was right or not but I'd give it a try. I put the absolute loader tape on the teletype reader. 3. Next I set the front panel to bootstrap loader address and pressed START. I then switched the Teletype's reader START lever up. The tape began to read into the PDP 11 and I watched the lights on the front panel as it progressed. It appeared as if the bootstrap loader ran properly and in doing so caused the absolute loader program to load into memory successfully. The tape ended and simultaneously the RUN light went out. 4. I stopped the system and loaded the BASIC tape. I set the appropriate loader values on the front panel and then set the absolute loader address for BASIC. I pressed START on the PDP 11 and then I engaged the teletype reader start switch (press up). The teletype read the BASIC tape into the PDP 11. 5. It took about 20-30 minutes for the BASIC tape to read. During this time the system lights blinked at a high rate and the RUN light stayed on. This was a good sign. 6. 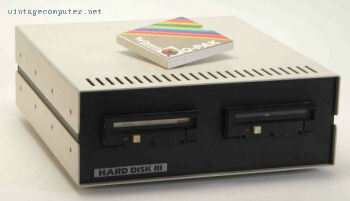 As described in the DEC Papertape BASIC manual, the tape finished and the system initiated the BASIC program automatically. I was quite amazed that it worked! 7. After running a few tests I got out my video camera to record the initial testing. NEXT - Can you save and load BASIC programs on papertape without the reader run card? View of the pin side of the backplanes installed in the 11/05 NC. The bottom backplane is for the CPU/RAM. 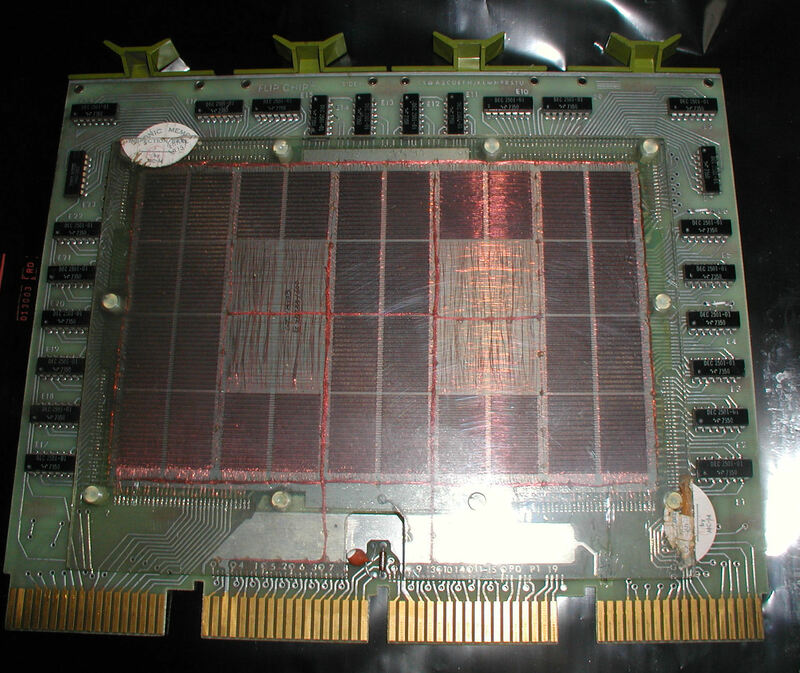 The top backplane is a DD11-B, used for peripheral devices that have Non Processor (DMA) Grant continuity such as the M7800 serial card. Click image for larger view. View of the backplane 9-pin power connector ports. Click image for larger view. I was hoping that I might be able to run an RK05 drive from this box, but the power connectors are not compatible (although it may be possible to use an adapter). I don't have direct photos of the PDP 11/05 S power connectors, but I believe this model chassis is RK05-compatible. 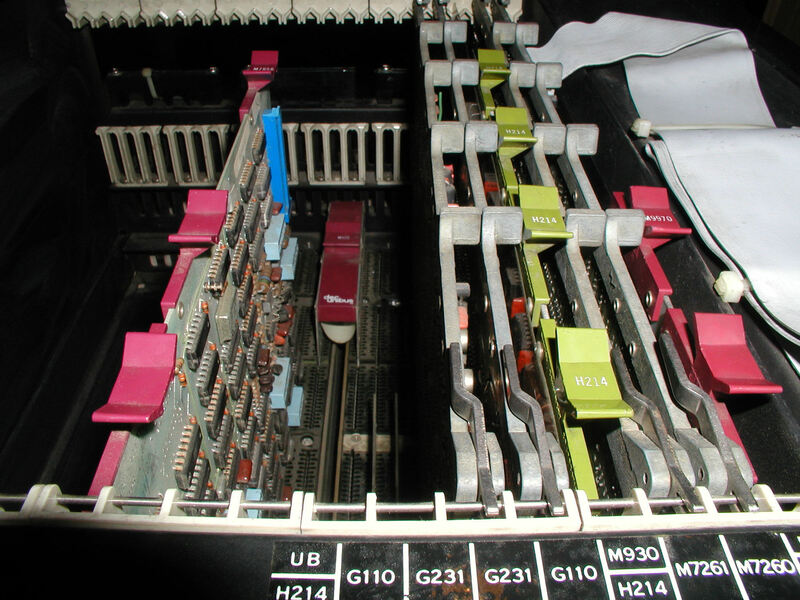 Here is a photo that shows the back side of the power connector board of the PDP 11/05 S, note there appear to the 6 and 15-pin connector ports.